Yup. It’s almost as though someone wanted to destroy all alternatives to the fiat dollar, so gold, silver, Bitcoins, and everything else are getting smashed. As Peter518 and MetalMeister discussed on the Forum, it could be that now that the Largest Dutch bank defaults on physical gold deliveries to customers we are nearing the end of the paper-rigging game. It’s relatively easy to pile on the shorts in the paper market. It’s much more difficult to corner or short the physical market. Physical demand remains strong, as proven by the experience with the Dutch bank. If gold really is so “hated”, why are they having trouble delivering it? What’s an investor or saver to do? The only logical option is to put your money in the one sure thing: the almighty dollar (or euro). 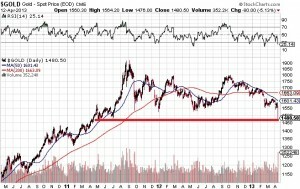 But you can’t buy gold stocks; they are getting hammered. Here’s a chart of HUI (Gold Bugs Index) denominated in gold. 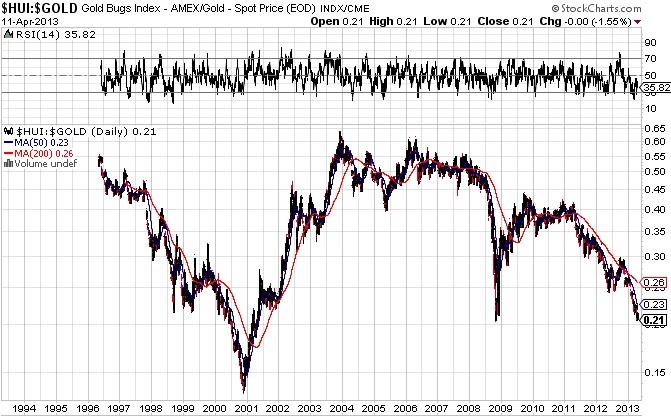 You would assume that gold stocks would move in the same direction as gold, only with greater leverage. For example, if gold goes up 10%, you might expect any particular gold stock may increase by 20%, or 50%, or whatever, depending on their costs of production, and therefore their leverage to the gold price. What we are seeing, however, is a lot more than simple leverage. 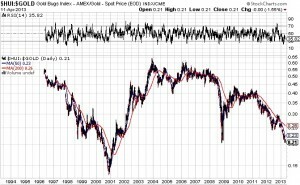 The HUI:GOLD ratio is down to levels not seen since late 2008, and mid 2001. Is this ratio near the bottom? I don’t know, but it would certainly appear that the .20 level could offer support. Or not. We are in somewhat uncharted territory, at least as far as government money printing is concerned. If word of short physical supply becomes more well known, does that change the dynamics? Gold closed down $80, of over 5%, and the closing price of $1,480.50 puts us back to where we were in May of 2011, almost two years ago. Think about that: all of the money printing and fiscal stimulus and quantitative easing and bailouts of the last two years has meant absolutely nothing to the price of gold. Since it doesn’t make sense, I have no alternative but to return to my original premise, which is that the Big Boyz are squeezing the market one more time. They are massively short at the moment, so by squeezing the paper market further down, they can cover their shorts, thereby making a huge profit, and then buy actual physical metal and dirt-cheap prices. In fact, it would appear that central banks are buying gold, and lots of it. First, they realize that all currencies are being depreciated, so it’s the only safe asset. They don’t trust the other central bankers. Second, if at some point confidence needs to be restored with a new gold-backed currency, they will need gold, so best to buy it now while it’s cheap. Market manipulation cannot last forever. At some point gold is going much higher. It may still go lower, but this would appear to be a great time to add to your physical holdings. I believe it’s also a good time to average down on the stocks that have been crushed, and that’s what I did on Friday. I averaged down on my top picks, because I believe we will look back on this time period in a few months and kick ourselves for not taking advantage of these sale prices. That’s it for tonight. I’m writing this by the light of a flashlight. My power has been off for over 24 hours, due to the big ice storm we experienced which knocked down some power lines feeding my area. Hopefully we are back up by Sunday. Fortunately we have a back up gas generator, which is powering the internet, our furnace, refrigerator, and some basic circuits (like my computer), but no lights in my basement office. Oh well, that’s Canada in “spring” for you.